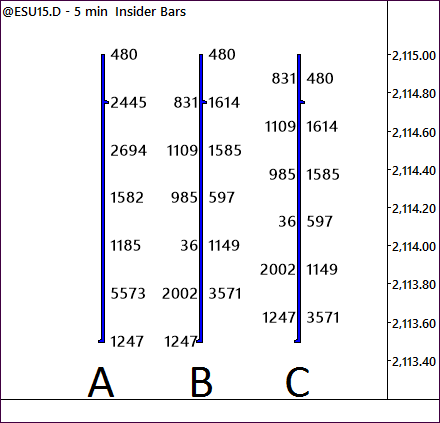 Insider Bars offers a new style of price x volume analysis called auction point analysis. Once you get to know it, you will find that is much easier to interpret than that the traditional methods you have seen in other platforms. However, it is a little confusing at first. Let’s look at an example. 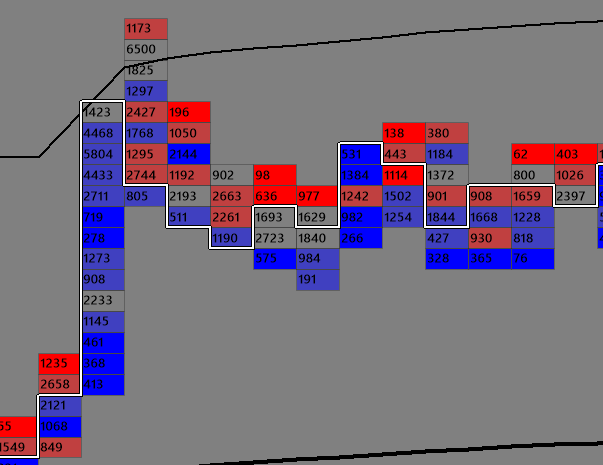 The blue and red shading represents prices where volume is skewed toward buyer and sellers, respectively. Note that there is only one column of numbers per bar, not two as with traditional order flow. Yet you have all the important information. So let’s see how this works. Auction point analysis is a more natural way to display and interpret market activity. Typically, order flow analysis has compared upticks and downticks (or bid and ask) at the same price. But if you think about it, this is not how the real world works. In an actual auction, the market bounces between, say 2081.00 (bid or downtick) and 2081.25 (ask or uptick). Order flow analysis is about analyzing auctions, and if you compare bids vs. asks or upticks vs. downticks at the same price, you are comparing apples and oranges. Traditional order flow analysis (B) either has you 1) compare the trades at bid on the left side of the bar trades at ask at the same price on the right (which is just plain wrong), or 2) compare trades at bid and at ask diagonally so that they go together (which is needlessly difficult). Interpreting any fast moving numbers is not something at which we humans excel. Our brains’ operating systems process information in shapes and patterns. Numbers require translation, and slow our reaction times. Auction point analysis sorts trades as they actually occur – as uptick/downtick or at bid/at ask pairs – for easier interpretation. Insider Bars offers both raw data and auction point options. 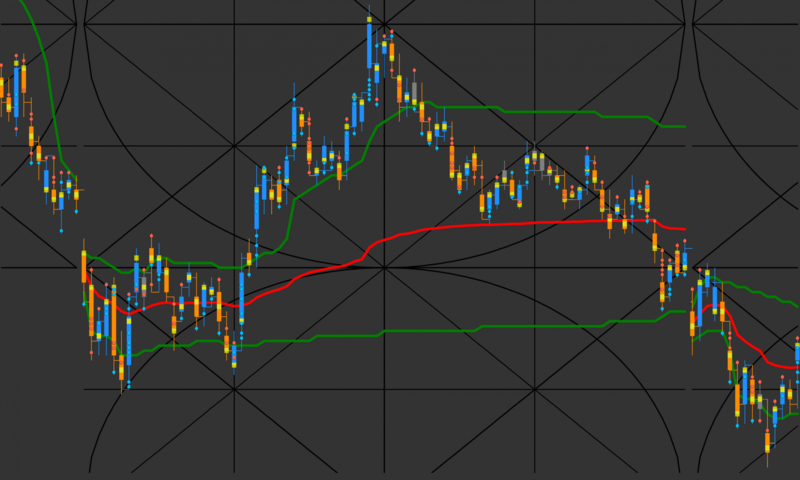 For calculating statistics like VWAP, value area and VPOC, raw data is all you need. And it is very helpful when first starting out, to understand how Insider Bars works. But most people eventually gravitate toward the easier interpretation of auction point. Note: Blog posts like this one offer basic information. For more details, see online help. © Copyright 2001-2019 N. Christopher Cheatham and OF•G.com. All rights reserved. Reproduction of techniques and materials presented is prohibited without prior written permission. All charts shown were created using TradeStation®. TradeStation® and EasyLanguage® are registered trademarks of TradeStation Technologies, Inc. The owner of this site makes this material available to the public but assumes absolutely no responsibility or liability. BY INVESTING IN SECURITIES, YOU CAN LOSE MONEY, INCLUDING YOUR PRINCIPAL INVESTMENT. PAST PERFORMANCE DOES NOT GUARANTEE FUTURE RESULTS. TRADING FUTURES REPRESENTS A HIGH-RISK, SPECULATIVE INVESTMENT AND IS NOT SUITABLE FOR EVERYONE.